If you didn't know I love to give gifts. I especially love giving gifts that are easy but look like I spent a lot of time on them. Here is one of my favorite gifts to give to someone who could use a little pampering. I like to decide on a color theme so everything corresponds in the jar. 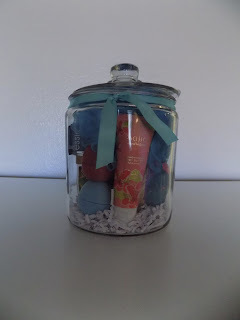 Place in some filler to the bottom of the jar, add in your items tie a bow around the jar and you are good to go! What are some of your favorite quick gifts?